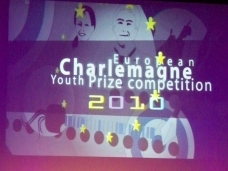 Our "Train for EUROPE" has won the European Charlemagne Youth Prize 2010. Charlemagne Prize Foundation Chairman Michael Jansen. 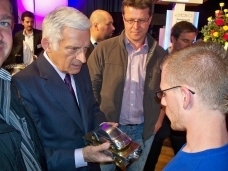 the discovery of diversity and its potential", said EP President Jerzy Buzek. Have a look to the complete speach of the president. Really a very great honour for our successful European partnership. Thanks a lot! Our "Train for EUROPE" starts as National Winner into the Final European Competition. 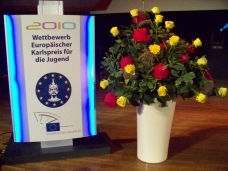 the National German Competition of European Charlemagne Youth Prize 2010. So the first step is done! Our “Train for EUROPE” will be in the Final European Competition Round. select the winner from the 27 projects submitted by national juries by 8 April 2010. 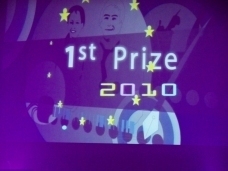 The prize for the best project will be € 5000, for the second € 3000 and for the third € 2000. 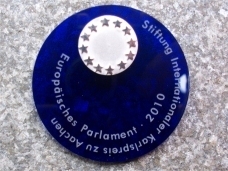 European Parliament and representative of the Foundation of the International Charlemagne Prize of Aachen. Let's move the "Train for EUROPE - RELOADED"! We have set the course for continuing our school partnership. Our preparatory visit in Dunaújváros (Hungary) from 26-11 to 01-12-2009 was successful! We plan to continue with activities in 2011! Our "Train for EUROPE" is now running with full speed! at BBS TGHS Bad Kreuznach (Germany) and St. Jozef Intistuut KOGEKA 4 in Geel (Belgium). took place from Tue, 21st to Mon, 27th of October 2008. So far all project steps are running on schedule and without major problems. Partner schools have already produced all the necessary sixty track segments. So the complete track system could be assembled and tested thoroughly. Many of the countries have already produced the chassis of their wagons. For the realization of the upper bodies of the wagons, people presented their creative designs and ideas. The engines of both electric locomotives could be successfully tested and checked. Furthermore, a positive feedback on work process was given by the steam engine group. The coupling was redesigned and its function was presented and tested in the meeting. The course of events and the organization of our final meeting was discussed and agreed on. Our work Line B Components was closed as all the tasks had been fulfilled. Instead, a new Task Force Line was established in order to deal with the still outstanding tasks. Important preparations for the final presentation in Brussels were set. One work group will deal with the online evaluation of the project and will set the list of questions online. A database for the multilingual technical dictionary with more than 400 specific terms will soon be completed. One work group will organize and upgrade our activities and results for a presentation on our internet platform. All partners took part in a questionnaire needed to compare the different educational systems. An evaluation and interpretation will be expected soon. All photos, videos, newspaper articles and other publications concerning our project will be collected and arranged in an online media archive and will be made available on DVD as well. The technical drawings and designs and the CNC programs of the locomotive and all the wagons will be provided online. The work group Quality Management will check and provide the standard of the drawings and programs. Communication via online video conference is made possible from now on. As all the meetings before, our third meeting was again supported in many different ways by our associated industrial partners. Further information can be found in our CNC-Network Forum and at Jaume's Barcelona Blog! has took place from Tue, 15th to Mon, 21st of April 2008. Further details will follow soon! The first project meeting took place in Albi at Lycée Louis Rascol from Tue 2007/12/04 till Mon 2007/12/10. Many thanks to our host! We have worked a lot and had a wonderful time anyway! More than 60 participants out of 24 European schools met in Albi for starting a great project. The programme provides a comprehensive overview of the project work. Albi is located 80 km from the closest airport Toulouse Blagnac [TLS]. Click for travelling informations concerning Toulouse-Albi and Albi-Toulouse. Please register at our new CNC-Network Forum! We are very happy that currently 24 partner get permission and will cooperate in our project. So we are able to start the largest, ever promoted COMENIUS school partnership of the European Union now. And we hope very much that our other partners will get a permission soon and could work with us in the project too! The "Train for EUROPE" is ready for takeoff! Here you will find the project profile with a short description and many information about our project (pdf-format). We are searching interested partner schools from European countries up to the request date in March 2007. If you are interested in participating, you can contact us at any time. We will answer all of your questions and we are open for all new ideas. And we will be very happy about each further partner school. You are welcome! Project product will be a "Train for EUROPE"
The participants will develop a European Network in the field of computerized numerically controlled (CNC) machines. The project will begin in October 2007 as part of the European COMENIUS programme "Lifelong Learning" (COMENIUS School Partnerships) and will run for two years. 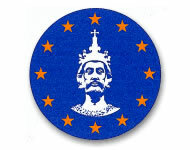 A promotion in accordance with COMENIUS network is intended for 2008. The participants have selected English as working language. The participants have agreed on a common product named "Train for EUROPE". The train will consist of a locomotive with several wagons. The locomotive and each wagon should have a width of 10 cm and a maximum length of 30 cm. The different parts of the locomotive will be the result of common planning and manufacturing based on a division of labour. Each partner school will provide several parts of the locomotive. The various parts of the locomotives will be assembled in the final meeting. The wagons will be individually designed and manufactured by each participant. The wagons will incorporate unique characteristics representing the different countries. the first is for presentation to the COMENIUS administration, the second is intended for each school’s own use. If circumstances allow, the participants will produce additional copies of their characteristic wagons for each of the countries involved in the project. At the end of the project each country should have one (nearly) complete "Train for EUROPE". The participants will come to an agreement regarding costs, manufacturing options and the design drawings. - Oct 2007: Coordination and distribution of the design tasks. - Mar 2008: Assessment and agreement on the design drawings. - Sep/Oct 2008: Planning and coordinating of the production tasks. - Apr 2009: Final assembly and presentation of our project "Train for EUROPE". - comparing the different kinds of vocational training and educational work with their trainees. - exchanging and developing teaching methods and materials. - evening out the differences in teaching, training methods and equipment. - developing a multilingual internet platform as a basis for a long-lasting communication. Each step of the project requires the continuous engagement of our students. The project is integrated in the targets and goals of the curricula for the training programmes of the different metal-working and electrical professions. Students and teachers should benefit from the exchange of experience by mutual visits. The BBS TGHS Bad Kreuznach (Germany) will take on the coordination of the project. Prior to the beginning of the project the participants will try to recruit additional participating countries. As many European countries as possible should be involved in the project. If you are interested in taking part, feel free to contact us. to result in a product supported by a "European CNC-network". of the different European educational institutes. that will bring the "European thinking" to life. The preparatory visit in Bad Kreuznach from 7th to 13th of November 2006 was a great success! when we started to contact different partner schools throughout Europe. and we have been overwhelmed by the interest. As a consequence we decided to invite members form all interested school to a preparatory meeting to Germany. During the meeting, we fixed details on the ongoing process of the common project work. 14 schools with 24 teachers from all over Europe have received financial support by their National Agencies. The programme for the preparatory visit contained five Workshops and a lot of cultural highlights. which supported the participating schools in writing the request for their national agencies. and of the Schooladministration (ADD) Trier and Koblenz. We furthermore welcomed representatives of the District and the City of Bad Kreuznach. We would like to say thanks for the generous financial support to all of our sponsors and specially to our Ministry of Education (MBFJ) in Mainz. Without that help the preparatory visit had never taken place. Thank you very much! We are building up our Internet presentation at the moment. Since April 2006 our project "European CNC-Network" has been online. So we have realized an important information platform for the common work on our project. www.cnc-netzwerk.eu (German) and www.cnc-network.eu (English). Both addresses are linked with each other. With a simple mouseclick is it possible to change between German and English language. Our Internet presentation will be completed in the next weeks step by step.